No one said growing your business would be easy. You’re up for the challenge. You just need a plan. You’ve got the right team, the product or service. Now, it’s just a matter of getting your brand out there in front of more people. Not just any people. The right people. You know? The ones you can turn into lifelong customers. That’s where SEO advertising comes in. It’s the way to get the word out. Grow your business faster and more cost-effectively than you could any other way. Over 1 trillion searches happen every day. Nearly 75% of them are through Google. Over 50% of business website traffic comes in through these searches. Sounds amazing. Free traffic, right? The website at the top of the organic searches gets over 1/3 of the organic clicks in searches. “Organic” is a term used by online marketers. It means the regular search listings. Google gets to decide who the top 3 sites are in the organic results. Not in one of those top 3 organic search spots? What about you? Well, your share of organic traffic is next to non-existent. 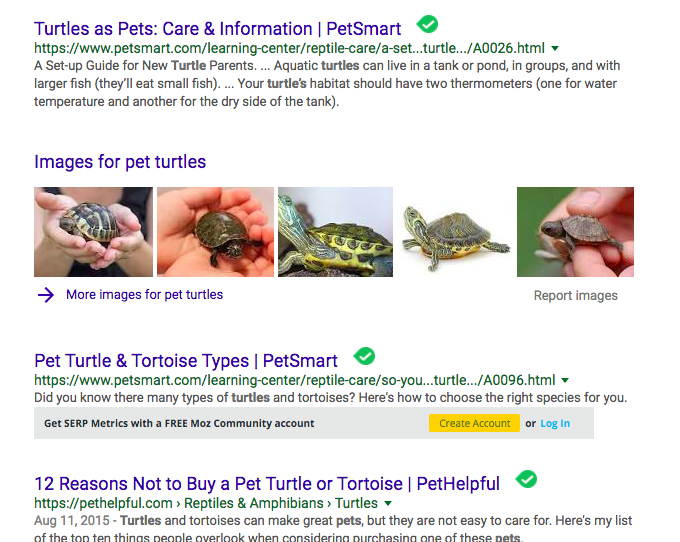 Check out the organic search results for “Pet Turtles”. Notice anything particular about the top 2 listings? Ever heard of PetSmart? That’s a large national brand. Big businesses spend millions to claim those top spots through SEO. That’s search engine optimization. SEO is vital for the long-term success of your website and theirs. But some may use tricks and tactics to earn those top spots. Even when they spend this kind of money, it still takes months to a year to even get to page one. Most small businesses don’t have that kind of time to wait. They don’t have the money to invest with the return horizon so far away. SEO advertising is different. It gets you to the top of searches instantly. But it also focuses on earning you those top spots for organic traffic. It’s the two-fold strategy you need for growth and long-term success. You’re not fighting with big companies to quickly earn those top organic spots. But you still get seen. You get to set your own budget and reach the right audience with the right message quickly. But you invest in a long term, more cost-effective, organic strategy at the same time. There are two vital sides to SEO advertising. It includes optimizing your website so that it is more visible in organic searches. But it recognizes that unless you have millions to spend, it takes time to rise in the ranks. Because of this, it’s supplemented by pay-per-click advertising. Together, these are the dynamic duo of marketing. They’re peas in a pod. A power couple. Whatever you want to call it. It works. Google, and other search engines like Bing, will allow you to pay to be at the top of searches. If it sounds like a sham, hear this. You don’t pay anything if they don’t click on your ad. That’s right. You create an amazing ad that people want to click. And once they’re back on your site, you convert that click into a paying customer. There is no single way to get more website traffic faster than this. Maybe not that fast. But it’s like instant brand awareness. There’s more. These ads only appear when someone searches for what you offer. PPC advertising is highly targeted. It’s high intention traffic funneled right to your website. PPC Advertising can be tweaked and perfected over time. But you’ll instantly see visitors coming into your website. We’ll talk a little more about how to turn all of this traffic into paying customers a little later. SEO is what you do to your actual website. Search engines like Google are constantly judging your website. They want to know if you provide a great customer experience. They try to determine if you’re a trustworthy website. The better you can demonstrate that your site does this, the better your visibility will become. Be really clear on who your target audience is. If you attract the wrong people to your website, they’ll leave. That’s not a good experience. Create and publish website content around your target customer. Use content to reach customers at different phases of their buyer’s journey. This helps them take the next step. Optimizing your website for search engines is a sustainable marketing strategy. It pays you back many times over for a long period of time. But it does require initial setup and ongoing maintenance. For a brand new site, it typically takes 12+ months to get significant results. But you should see some movement within 6 months. Have a well-established site that’s already getting some decent traffic? Results should be faster. Why does SEO take so long? Search engines need to know that you’re legitimate. They don’t want to reward a site that’s using questionable tactics to rise in organic ranking. They don’t want to make a mistake. It takes some time to show search engines that you’re not a fly-by-night website. This distant horizon for SEO is why PPC and SEO are the perfect pair. You win with SEO advertising. Pay per click doesn’t directly improve your rankings. But it does increase brand awareness. More people will click on you in organic searches because of it. Getting started is easy. You’ll be doing some research for both PPC and SEO. Fortunately, much of your research will overlap. It’s helpful to have tools at your disposal. We’ll discuss these briefly. But a lot of it can be done manually. It just takes a lot longer. As your skills grow, you begin to realize the benefits of SEO advertising. You’ll want to invest in tools that make it easier. The most cost-effective thing to do is to work with people who already have them. Let’s look at what you need to do before you start just running these ads. Here’s a rundown on the research you need to do. We’ll go in-depth into how to do it. All of these assets are important. But perhaps the most important is analytics. Analytics tells you what’s working and what isn’t. Without it, your SEO advertising can fall down many rabbit holes. We already discussed how many people use search engines to find what they’re looking for. But their demographics vary some. By far, most people use Google. It doesn’t matter if they’re in Norway, Louisiana or South Korea. Old or young? Rich or poor? If your business falls into one of these 4 categories, Bing may be a great place to invest SEO advertising dollars. Canada and the UK are also partial to Bing. Mac/Apple users are also more likely to use Google. People who use Microsoft products at home tend to use Bing. This has a lot more to do with default settings on their devices. It has little to do with preference. Tools like these let you download the keywords that the competition is targeting. Without ever paying a dime for a click, you’ll already know which keywords give them the best bang for their buck. Start optimizing your SEO advertising before you even start to run an efficient SEO advertising campaign. You’ll get much less usable data. But it’s a good start. Sell hiking supplies? 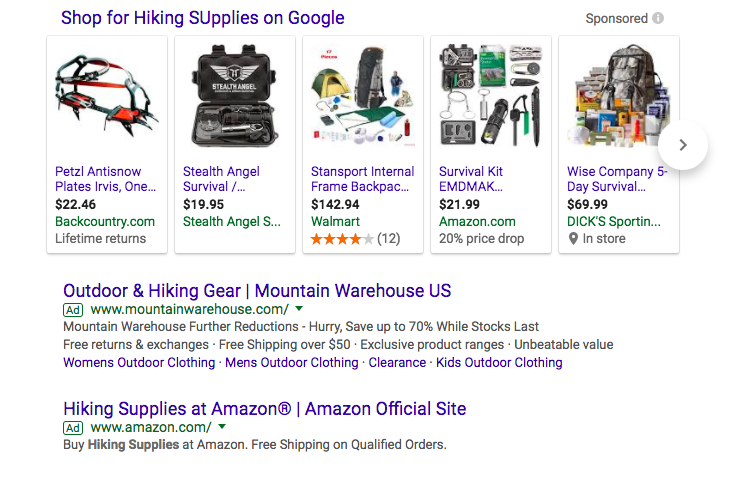 Do a Google search for “Hiking Supplies”. See what comes up. Content marked sponsored or ad are your Pay per click competitors. The listing below them are your organic competitors. They may be the outdoor shop on the other side of town. Or they may be national. In SEO advertising, your competitors are the people coming up in searches. Do you love free as much as we do? Adwords Keyword Planner gives you an idea of what you’ll be paying for each click in your Paid SEO advertising campaign. You can use this as an estimator to better understand the potential costs for pay per click. You’ll know from this which words are getting decent traffic so that you can target those words in organic searches. You do this by including them in your content. This will also let you know when a keyword is out of your price range. Let’s say you want your ad to appear on “Find a real estate agent”. You can see that this keyword gets lots of traffic. That’s a plus. But according to keyword planner, you’ll pay nearly $14 for a click. Depending on your business, model this may or may not be a high acquisition cost. In real estate, it likely isn’t. But tools like this give you the data. You make those calls. Fortunately, they’ll give you a long list of alternatives if a keyword is too pricey. Find the ones that are right for you. 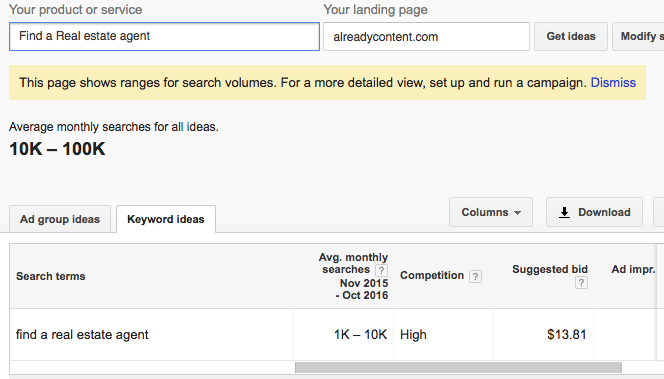 You can further use Adwords plan overview to estimate the number of clicks you’ll earn for a certain campaign. Remember, though. These are all estimations. How accurate they are will largely depend on how well you design your ads. We’ll discuss that a little later. You’re ready to grow your business. SEO advertising is the way to do it. But you won’t just start posting some random ads and hoping for the best. You need to build content assets that streamline the process. 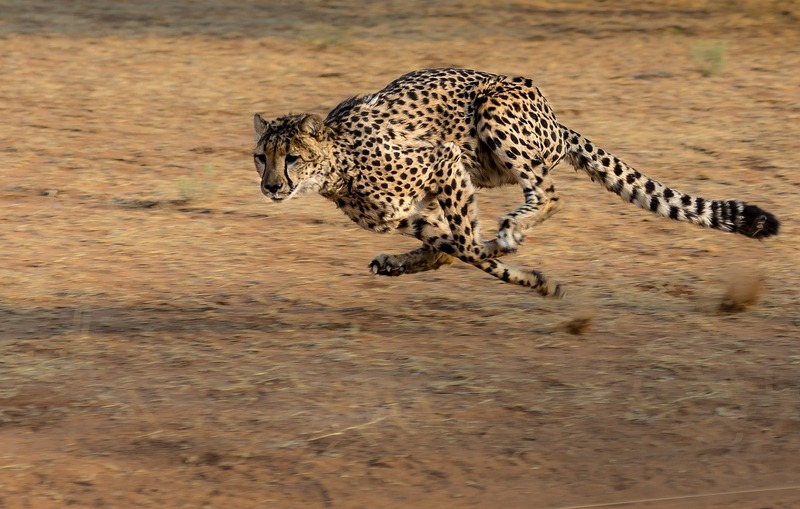 On the pay per click side of SEO advertising, the clicker’s journey goes something like this. Build your content assets around this SEO advertising buyer’s journey. These 5 tips will help you create the most clickable ads. Did you play mirror-me in Kindergarten? In case you don’t remember, it’s a game where you stand in front of a friend. You mimic their every movement. Your ad should mirror the intentions of the user. What does the person want to accomplish? Create your ad around this understanding. Don’t go crazy. It’s obnoxious. It will backfire. But do put numbers and appropriate symbols in the ad. People are naturally drawn to these. Our brains think they’re important. A stat, a discount, whatever — include it to get attention. Strike an emotional chord with the person. Make them feel like they deserve what you have. Make them fear missing out. Tap into nostalgia. Connect with an emotion to earn a click. You know the objections people have in your industry. Play on this to shoot your ad to the top of their list as they’re weighing options. Remember, it’s not the other way around. To create a clickable ad, state your value proposition. Forget for a minute that you want to grow. Think about what they want out of you. How does your business uniquely meet these needs? Build your ad around it. You’ll build various ad groups around your target audiences so that you can speak very directly to each one. Create several ads within several ad groups. Create a clever ad to connect with cardiology. It includes some info about heart health. That ad may work great for this target. But you need one about teeth and gums for the dentist. Ad groups help you get the right message in front of the right person. The most successful PPC campaigns in SEO advertising have at least 10 landing pages. Why so many? You’re selling basically the same thing, right? Remember our cardiology example above? You need a landing page that continues to speak directly to this audience after the click the ad. Through this hyperfocus, you keep your target engaged through the entire SEO advertising journey. Let’s look at 5 vital components for an SEO advertising landing page. Each landing page is clearly aligned with the ad that links to it. It feels like an indisputable extension of that ad. If the ad made an offer, the landing page references that offer. It clearly shows how to redeem it. Some advertising is text only. Others have images. Regardless, your landing page should instantly draw a person in a relevant visual. It could be a video or HD image. A relevant visual instantly communicates a message to the visitor. 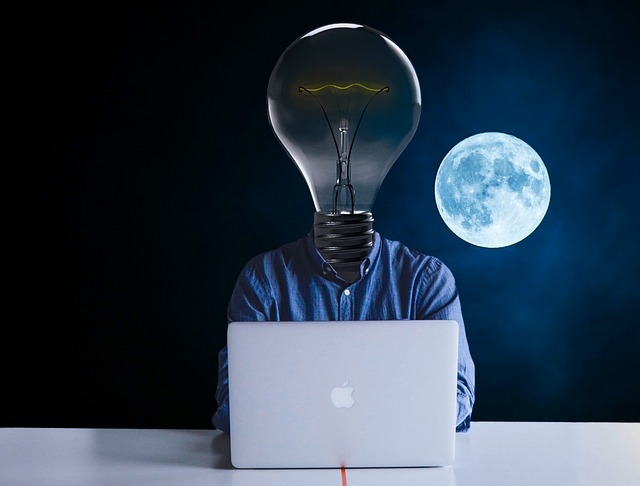 Are you selling a bright idea? A visual like this will do the trick. Download or embed a tool that shows this and keeps it up to date for you. To SEO your website, you need to create compelling content. Take the research you’ve done on your competitors and keywords. Consider your target audience. Start building content around topics that your customers will love. Let’s look at 3 quick tips for compelling content. You’ll hear all kinds of clever SEO tricks to get you higher in organic searches. But remember that customer experience is vital. You can balance customer experience with organic tactics. Never just create content for the search engines. Having a lot of content will help you earn those organic top spots faster. But each piece should high quality. It should add value to your customer’s life. Great content needs a distribution channel. Initially, you need to drive traffic to it. This allows it to pick up steam. As your organic rankings improve, it becomes a link-magnet, pulling traffic into itself. As more people share it and link to it, the content’s authority with rise. 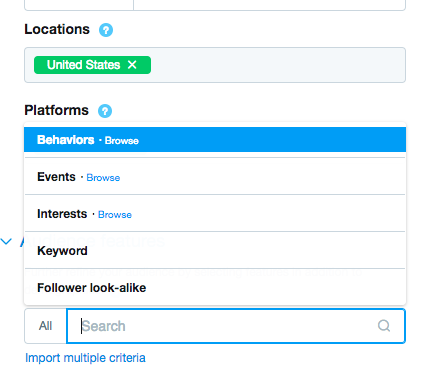 So will its visibility in searches. Here’s where the amazing marriage between PPC and SEO in SEO advertising is so useful. Also share on social media. In the next section, we’ll look at how to choose the best social media platform to distribute your content. SEO advertising is primarily done in search engines. But you know the importance of repetition in marketing. Reach potential customers where you can with SEO advertising. But be strategic about it. Otherwise, you end up spending a bunch of money in places that don’t work. Many social media sites and websites provide you with an opportunity to advertise on their site with the same pay per click model. But each social platform has a different audience. Let’s find the one that’s right for you. 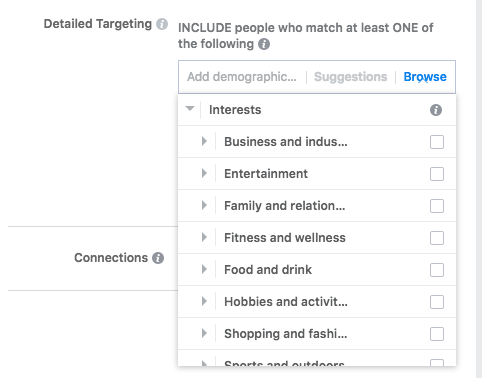 With over 1 billion users, Facebook is a great place to get your ads in front of a lot of people. Take a look at this chart from Pew Research Institute. 83% of women. 75% of men are on this site. As far as age goes, Facebook doesn’t discriminate. While the percentage of 50+ on Facebook falls slightly from 84% to 72%, Facebook even has 62% of the 65+ crowd. Regardless of age or gender, your target audience is here. 81% of people in cities are on Facebook. 81% of people who live rurally are on it as well. But only a measly 77% of people in burbs are on this platform. What are we saying? That’s still almost all of them. We could continue with education, income, etc. But it’s consistent across the board. This is all very broad though. The great thing about advertising on Facebook is that it really lets you drill down to reach exactly who you want to reach. Drill down to specific interests, behaviors and more. This kind of social media SEO advertising allows you to reach each segment of your target audience with the right message every time. An easy graph shows you your possible reach based upon the selection you’ve made. You’re not left guessing how many people will see your ad. Facebook leaves others in the dust just in terms of volume. But this doesn’t mean that you shouldn’t branch out. Multi-channel marketing is important. It reinforces your message in different locations. Many Facebook users are also on other platforms. Be there too! Facebook is popular across the board. But Twitter is much more popular with millennials and younger gen Xers than the older crowd. For example, 36% of 18-29 year-olds are on it. In the 65+ crowd, it drops to 10%. It’s an even split between men and women. The urban-burbs-rural split is also roughly even. But wait! Below the numbers do diverge. Most Twitter users graduated from college. They tend to be higher wage earners. You can similarly drill down to events, interests and more to reach the right audience. You probably know Linkedin as social media for professionals. It has close of 500 million users. A quarter are in the US. Linkedin is skewed male but only slightly with a 4% difference. Most users live in cities with only an 18% user rate in rural areas. 77% of Linkedin users have some college. The vast majority graduated. They also tend to be on the higher end of pay scale. While there are job seekers on Linkedin, most are gainfully employed. According to Pew Research, 1/2 of Instagram users use it at least once a day. That makes it second only to Facebook. This is a great opportunity to reach your audience with social media SEO advertising. But who are your Instagram users? 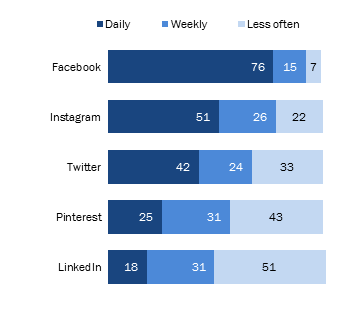 Instagram skews heavily toward women. Nearly 40% of women are on it compared to roughly a quarter of men. Users also tend to be younger. Almost 60% of users are under 30. In terms of education, location and income though, the numbers are fairly even. The number of city users is slightly higher. If you’re targeting millennial females, this is the place. On top of this, Instagram is a growing community. 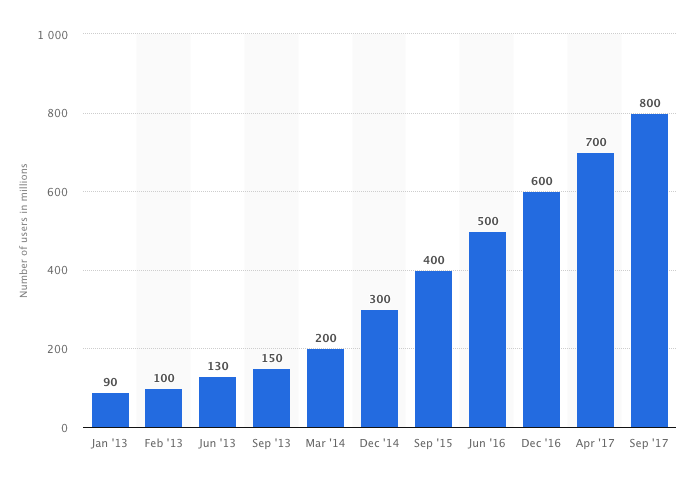 Checkout this growth reported by Statista. Instagram is partnered with Facebook to target specific audiences. Despite Instagram’s younger age, this gives you access to a long history of user behavior and interests. Put your ads in front of the right people by narrowing your reach strategically. You can learn more about Instagram benefits here. Run your ad campaigns. As the clicks begin coming in, analyze your data. Ask important questions. Which ads earn the most clicks? Which keywords drive the most traffic? Which landing pages convert? What is this data telling you? Are some aspects more successful than others? Consider the data. Optimize your ad campaign to maximize your returns. On the organic side of things, use Google Analytics to track the incoming traffic. Where is the most traffic coming from? How are people interacting with your content? Which content is performing best? Optimize it. Pay per click ads on social media and search engines are both fast and effective way to grow your business. Research is vital. And having the right tools can make planning much easier and more effective. Build content assets that not only encourage clicks. They seamlessly carry a person through the ad buyer’s journey. We’ve got the tools. We have the experience. We can help you get results in online marketing. Get in touch & Grow your business.